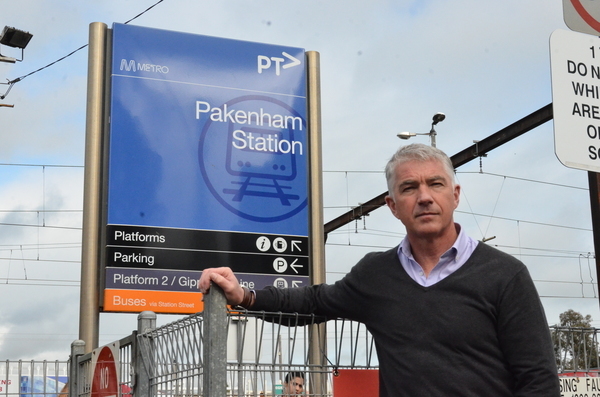 Pakenham Railway Station has been labelled the “worst” premium station in Victoria by Bass MP Brian Paynter, who is calling for upgrades and the removal of level crossings locally. “This station hasn’t changed since I caught the train back in the 1970s,” Mr Paynter said. “I want to challenge the Transport Minister to show me a worse premium station in Victoria, because I don’t think there is one. Opening in 1877, Pakenham Station didn’t go on to become a premium station until 1997. A majority of the pebble stone structure as it currently stands hasn’t been altered since the mid ‘70s. In terms of station standards, a premium station is a high standard station that has better staffing and facilities than standard stations – such as staff from the first to last train, amenities and bicycle cages. While the station has these facilities, the MP says they are aging and need to be modernised. “It’s an old station: the toilets are old, the indoor area is too small and there’s hardly any shelter for commuters in the winter. “With the new depot being built in Pakenham’s east there are going to be even more trains clogging up the level crossings. The Stabling Yards in Pakenham’s east will be used to maintain and store trains while the actual construction of the trains will occur elsewhere. With over 20,000 additional people predicted to settle in Pakenham with the development of Parklea’s Pakenham East estate – and no railway station to accommodate the population, it begs the question of whether Pakenham Station will be able to cope with such an influx in its current state. Despite public transport being outside their jurisdiction, the council say they are lobbying for the station’s revival on behalf of the municipality. “Council continues to advocate to the Victorian Government for improved public transport for our community, however this needs to be complemented by infrastructure to support this,” Council’s General Manager of Planning and Development Andrew Paxton said. “We share the community’s concerns that already congested roads will be further impacted by increased frequency of trains at key crossings. The Public Transport Minister was quick on the return shot to Mr Paynter, saying his party should have made changes when they had the chance. “Jordan Crugnale, the fantastic Labor candidate for Bass, has asked me to visit Pakenham station with her soon to talk to locals about the services they need and the facilities they expect,” Public Transport Minister Jacinta Allan said. Major transport upgrades are underway for the Cranbourne/Pakenham line. In addition to the level crossing removals, there will also be signalling and power upgrades, new high capacity trains, increased timetables, and the benefits of the Metro Tunnel. As part of the preparation for new high capacity trains, platforms at 13 stations along the Cranbourne/Pakenham line are being extended as required to accommodate seven carriage high capacity trains. The level crossing removals, together with signalling and power upgrades and bigger trains, will create space for 11,000 more passengers in every two-hour morning peak.